Luiz Inácio “Lula” da Silva was President of Brazil for two consecutive terms. During his administration, 29 million people were lifted from poverty, causing the middle class to grow to 51% of the population. With favorable winds at the international level, Lula stabilized the Brazilian economy, which allowed the country to grow an average 4.1% per year. He paid the national debt with the IMF in full, and reduced the unemployment rate from 10.5% in December 2002 to 5.7% in November 2010. He concluded his second term with the highest approval rating in the history of the country: 87%. Brazilian law establishes that presidents cannot govern for more than two consecutive terms, but Lula was succeeded by a member of his party: Dilma Rousseff. Scandal erupts when a corruption network is exposed that involves several high-ranking officials and businessmen. The case is known in Brazil as “Lava Jato” (car wash) operation. Brazil’s state-run oil company tendered contracts to big engineering and construction companies in Brazil. One of these companies is called Odebrecht. For years, Odebrecht bribed three of the main executives of Petrobras in order to win tenders. The bribe consisted in 3% of the cost of the contract, which was divided among politicians and businessmen. $8 billion dollars were laundered through a criminal network that operated across several countries in Latin America. Therefore, the scandal had repercussions beyond Bazil. In Brazil, the network included politicians from several parties, from Michel Temer and seven ministers of his government to members of Lula’s Workers’ Party (PT). Unlike Temer, Lula asked the country for forgiveness, declared he had been deceived by some of his party-members and dismantled the leadership of the country and removed from government his right hand, former guerrilla José Dirceu, who according to the general prosecutor was the one who built the network. The impeachment of Dilma Rousseff begins with a petition for her impeachment accepted by Eduardo Cunha, the then president of the Chamber of Deputies, and continued into late 2016. Rousseff, more than 12 months into her second four-year term, was charged with criminal administrative misconduct and disregard for the federal budget (unrelated to the Odebrecht case). Many pointed out that the method Rousseff had used to re-allocate budget had also been used by every president that had preceded her–and it had been widely accepted as a manner of funding government initiatives. People protesting against the coup, the slogan ‘Fora Temer’ means Out Temer! Former deputy Eduardo Cunha, who allowed (and promoted) the impeachment of Dilma Rousseff, is detained on accounts of corruption. In late March 2017 he was condemned to 15 years and 4 months in prison for corruption. Rousseff is suspended from her seat. Michel Temer, Vice President of Brazil and member of the Brazilian Democratic Movement (MDB) party, takes on as interim president. A leaked conversation causes a minister of the interim government to step down. He will be the first of seven ministers that Temer will lose due to direct or indirect links with the Odebrecht corruption network. Temer himself becomes a suspect in the Odebrecht case, after a declaration given to justice by Sergio Machado, former president of Transpetro, a subsidiary of Petrobras. Rousseff is deposed by the Senate and Michel Temer is appointed President of Brazil. Protests break out throughout Brazil denouncing this as a Parliamentary coup, although opposition members back the ousting. Since his inauguration, Temer has passed unpopular laws such as lifting protections on Amazonia rainforest, a pension reform and a labor reform. Lula is condemned to 9.5 years in prison for corruption and money laundering—without proof. This case is unrelated to Odebrecht, because no links were found between Lula and this case. In 2008, Marisa Leticia, Lula’s late wife, had begun making payments for an 82 square meter house in the city of Guarujá. But in 2015 she cancelled the purchase and requested a refund for the payments she had made. The unit was never under Lula’s or his wife’s name. However, Bancoop, the cooperative that had managed the construction project, had transferred everything to a company called OAS, whose president, Leo Pinheiro, later declared that Lula had received this property from the company as a bribe in exchange for contracts with Petrobras. A survey by Datafolha reveals that 34% of Brazilians intend to vote Lula in the 2018 elections, and in the case of a runoff Lula would win against any of the potential contenders. Three judges of a Porto Alegre court not only unanimously ratified the guilty sentence but increased the punishment to 12 years and a month in prison. Luiz Gonzaga Schroeder Lessa, a retired general of the Brazilian Army, induces fear of a military coup by affirming that “the crisis will be solved at gunpoint” and that “blood will be shed”. He added that if Lula were to return to the presidency, the Armed Forces would have to “restore order”. Later that month, Lula’s convoy is attacked. Some consider it an attempted murder, others an act of intimidation. While Lula traveled with his entourage through the state of Parana, the buses they traveled in were shot at and the tires were slashed. 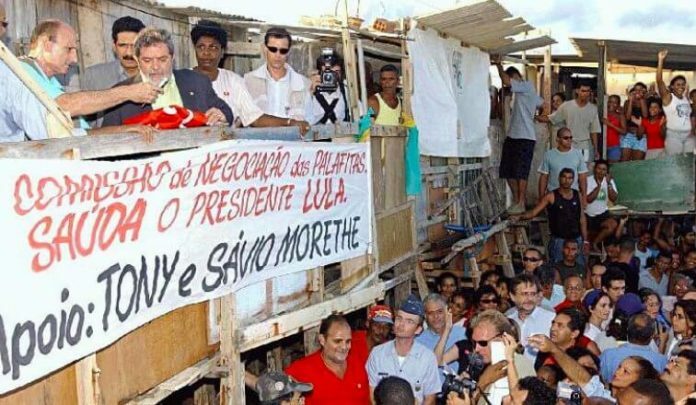 Lula’s campaign team had already denounced roadblocks and aggressions that difficulted their tour through the states of Brazil before the elections. The Supreme Court rejected the habeas corpus presented by ex-president Luiz Inácio Lula da Silva’s defense. The habeas corpus would have permitted Lula to remain free while he appeals his criminal conviction in a corruption case for which he has been sentenced to 12 years of prison. 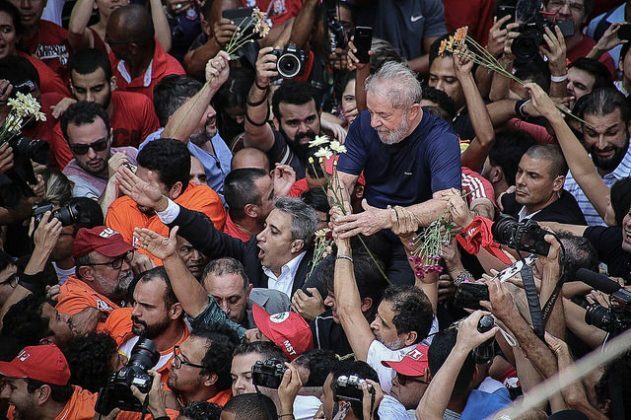 On April 7, after a vigil and and a rally in support of Lula at the Metal Workers’ Union where he began his social and political career, Lula voluntarily went to prison. According to Lula’s attorney, Cristiano Zanin Martins, his imprisonment violates the presumption of innocence. Due to the loss of legitimacy by Temer’s government and the Brazilian justice system, and the growing pressure from the grassroots to release Lula, many doubt that the former president will stay in prison for long. Presidential elections will be held in October. Is a Korean Spring Around the Corner?